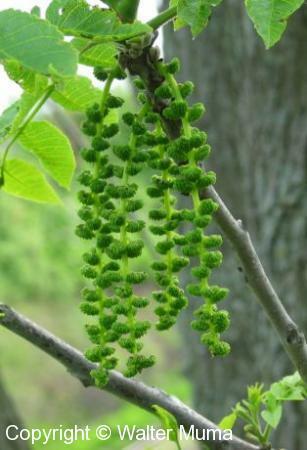  Butternut (Juglans cinerea) - has a large terminal leaflet.  Staghorn Sumac (Rhus typhina) - twigs and branches fuzzy. 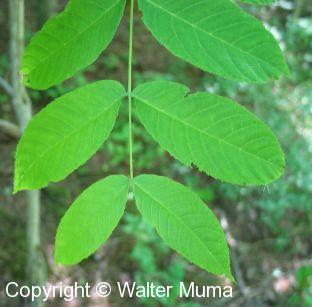 Leaves: Alternate, Compound, Toothed; Black Walnut trees have compound alternate leaves which are very pungent when rubbed, . Habitat: Forests, Fields and Open Areas; Forests, open areas. Photographs: 86 photographs available, of which 11 are featured on this page. SCROLL DOWN FOR PHOTOGRAPHS. A Black Walnut compound leaf. The end leaflet is sometimes missing. 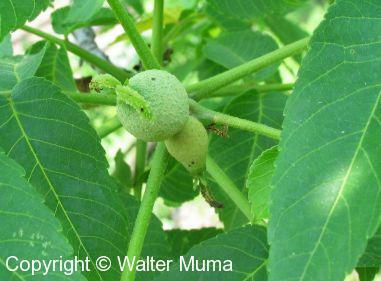 This is a good way to ID this tree and distinguish it from Butternut (Juglans cinerea). Here is what a grove of Black Walnut trees looks like. Typical Black Walnut bark, on a mature tree. 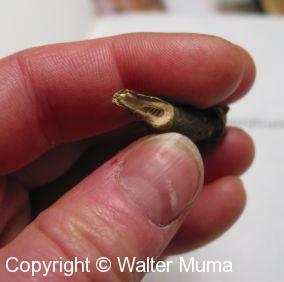 A broken-off twig, showing the chambered pith. Black Walnut edible, although it's a lot of work to get at the meat inside, and there isn't much of it. On the left are young nuts just starting to grow in late June. 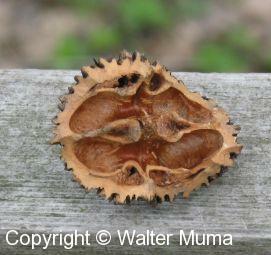 This photo shows the inside of a nut that has been gnawed by squirrels, chipmunks, or other rodents.